LED lights are all the rage these days, offering promises of dramatically lower energy consumption and long life. Until recently, all aquarium LED lighting systems were external units intended to be placed on top of a tank. Marineland has recently introduced their new Hidden LED Lighting System which is fully enclosed and waterproof. It can be used inside an aquarium hood or actually submersed in the water. I have a dual stack of custom-made 50 gallon tanks which are fully enclosed. To light these tanks, I use marine-style fluorescent end caps powered by an external ballast. Recently, one set of end-caps shorted out blowing out my expensive Ott bulb. It was time to try something new and hence this review. At the ACA Convention, I heard of this new product, so I had it in mind. I paid about $48 US on sale for a 17" unit. Marineland offers both a 17" and 21" version of the Hidden LED Lighting System which combines 6,500K white and 460nm blue LEDs for general aquarium illumination. 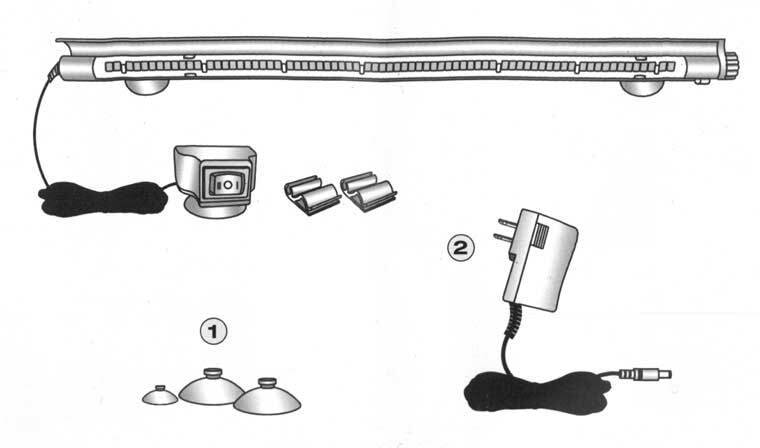 The switch provided is 3-way (Off, Blue, and Blue+White LEDs) which equates to off, lunar and daytime lighting. Marineland does not rate either lighting system by tank size or watts. Instead, these units are rated in lumens. I don't think most freshwater aquarists are familiar with lumen ratings, but the 17-inch until offers 400 lumens and the 21" unit comes in at 550 lumens. Either the 17 or 21-inch unit may be attached with suction cups or by clipping to the tank frame. Marineland provides a clever attachment system that works well. I used the clips to attach to an internal rail I installed in my tank. It's easy to pull the unit out for cleaning. The lunar light mode provides a nice blue accent to the tank. This is a great mode to use first thing in the morning when you are trying to wake up your fish. With all LEDs on, however, lighting for my 50 gallon tank was inadequate. Marineland bills this item as a "complete, submersible lighting system" and given the price, I was expecting higher light output. The light output might be OK for a smaller tank, for example a 15-20 gallon tank. The light has a shimmering effect because the blue LEDs are always on. It's kind of cool, but it makes it a bit hard to see the fish. I can't give a glowing (no pun intended) recommendation for this product because the light output is so low. I own several other Marineland LED systems, such as the Single Brite units and they seem markedly brighter to me. It could be that the Single Brite systems include a tiny reflector behind each LED which amplifies light. The 18" Single Brite is rated at 300 lumens compared to the 400 lumen 17" Hidden LED system and it appears twice as bright to me. I use an 18" Single Brite on a 40G tank of about the same size and the illumination is great. I wish Marineland had forgone the blue LEDs and included more white leds with a better reflector. This product really is a great idea, but it falls short in execution. Fortunately, I don't grow plants and the fish don't seem to mind the light. I was happy I was able to find a product to replace my end caps and lower my energy costs, but I compromised on having a nicely lit tank. Ever have a tank get cloudy? I think everyone has experienced this at one time or another. Most recently, I had a really bad snail outbreak in a 90-gallon tank, so I removed the fish (which I was selling anyway) and bleached the tank. After 24-hours of snail-killing bleach, I stirred the sand substrate and siphoned out as much debris as I could. Then, I refilled the tank. This is where the "cloudy" happened. After filling the tank and re-starting the filter, the tank was cloudy with very fine sediment. Usually, the filter will remove this in 24 hours. but after a week the tank was still cloudy. What to do? I was a bit stumped at this point, but then I remembered that I had won a goodie bag at one of the GCCA Meetings in the raffle. Inside, was an 8 ounce bottle of Accu-Clear from Aquarium Pharmaceuticals. This, I thought, is worth a try. Using the product is simple. Just dump in 1 teaspoon (5ml) per ten gallons of water. The cap offers a convenient measure built in. Bonus! Within 24-hours my tank water was sparkling clear! Accu-Clear is a flocculant. The chemicals in the product bond to particles in the water a bit like glue and aggregate them. The result is that the particles fall out of the water column to the bottom of the tank where you can ignore them (I did) or siphon them out. Although I didn't have fish in the tank at the time, you can use this product even if your tank is stocked. What else can I say? This product does what it claims to do. An 8 ounce bottle will run you $7 to $10 and will treat 480 gallons of water. 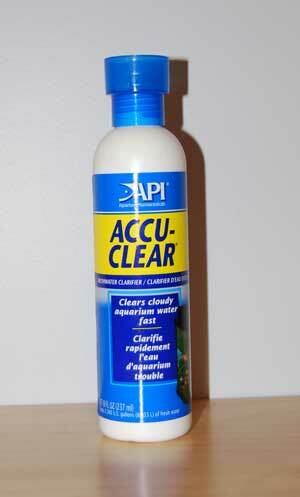 I think this is a good product that every aquarist ought to have on hand. I've been using Aquarian Flake Food for years. Unfortunately, about a year ago, Mars Pet Products stopped marketing Aquarian Flake Food in the United States. I heard that it had to do with regulatory issues. Finding a good replacement food hasn't been easy. So, what am I looking for? 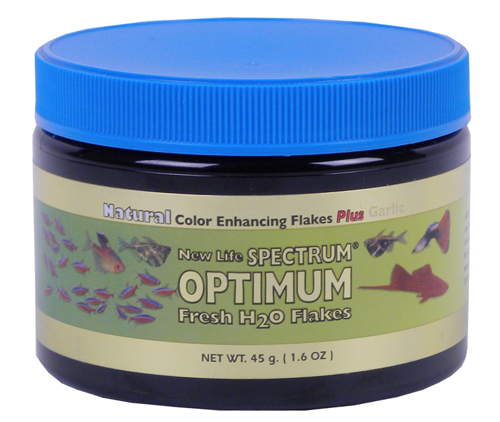 At this year's American Cichlid Association Convention, I picked up a couple of cans of food that I had not seen before: New Life Spectrum Optimum Fresh H20 Flakes. I was already familiar with New Life Spectrum Foods and have been using their pellets on and off throughout the years. Their pellet foods are so popular that many hobbyists generically use the term NLS to refer to the product. At first glance, I wasn't sure this would be a great cichlid food as the primary ingredients are heavily based on protein rather than vegetable products and the protein content of this food is a whopping 49%. That said, I primarily use flake for fry and juvenile cichlids and for my livebearers. Young cichlids can tolerate higher levels of protein in their diet. In addition, I generally vary what I feed my fish, rotating in a good spirulina flake. NLS Optimum Fresh H20 flake contains garlic which helps to prevent intestinal parasites and is a color enhancing flake. It even has ginseng as an ingredient. This food has a fiber content of 4% which is about on par with most other brands of non-vegetarian flakes. Whole Antarctic Krill Meal, Whole Herring Meal, Wheat Flour, Whole Squid Meal, Mussel Meal, Algae Meal, Garlic, Soybean Isolate, Beta Carotene, Spirulina, Vegetable and Fruit Extract (Spinach, Broccoli, Red Pepper, Zucchini, Tomato, Pea, Red and Green Cabbage, Apple, Apricot, Mango, Kiwi, Papaya, Peach, Pear), Ginseng, Vitamin A Acetate D-Activated Animal Sterol (D3), Vitamin B 12 supplement , Thiamine, Biotin, DL-Alphatocophero (E), Riboflavin Supplement , Niacin, Folic Acid, Calcium Pantothenate, Pyridoxine Hydrochloride, L-Ascorby-2-polyphosphate (Stable C), Choline Chloride Ethylenediamine Dihydroiodide, Cobalt Sulfate , Copper Proteinate, Manganese Sulfate, Ferrous Sulfate. NLS Optimum Fresh H20 flake has worked very well for me. I've seen great growth rates for my cichlid fry. It can be a real challenge to migrate fry from baby brine shrimp to flake, but this food is so appealing it hasn't been a problem. My livebearers seem to have shown the greatest benefit. I've seen increased spawning from mollies and goodeids and superior color. I liked the food so much I bought a 1.76 pound tub from Jehmco. I keep the large tub in the freezer and only take out what I need each week to feed my fish. A complaint about the bulk packaging is that it is really hard to open, especially when cold out of the freezer. I transferred the flake to another container with a screw-top lid.